I'm lucky to live in an area full of indie boutiques, but for those of us who don't have the time to window-shop in Mt. Pleasant or live too far away, there is a solution! 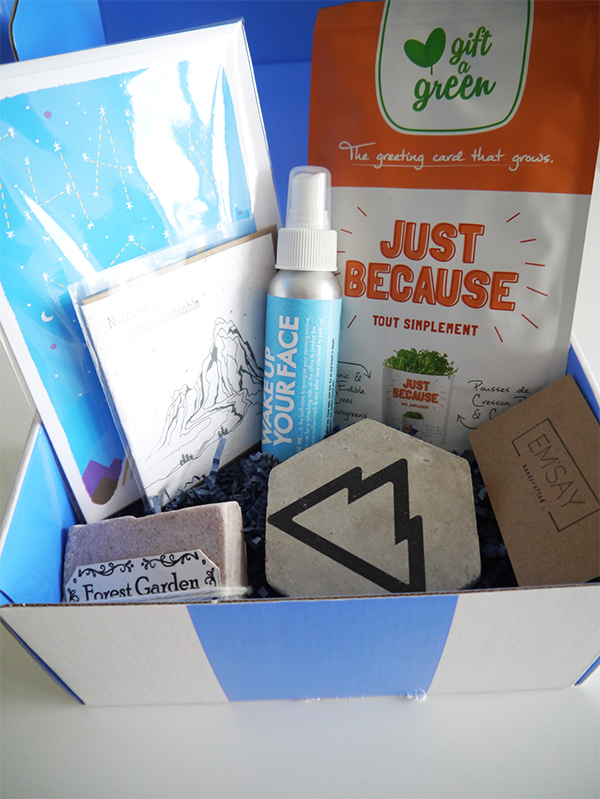 Enter Vancity Box, a new subscription box service that spotlights Vancouver makers. 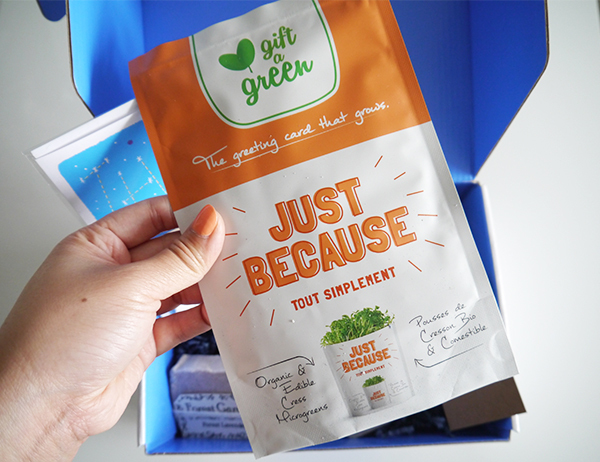 Marketed as "the city in a box" and "a farmer's market in a box," each month's curated selection aims to introduce subscribers to new-to-them labels and products from the Lower Mainland. 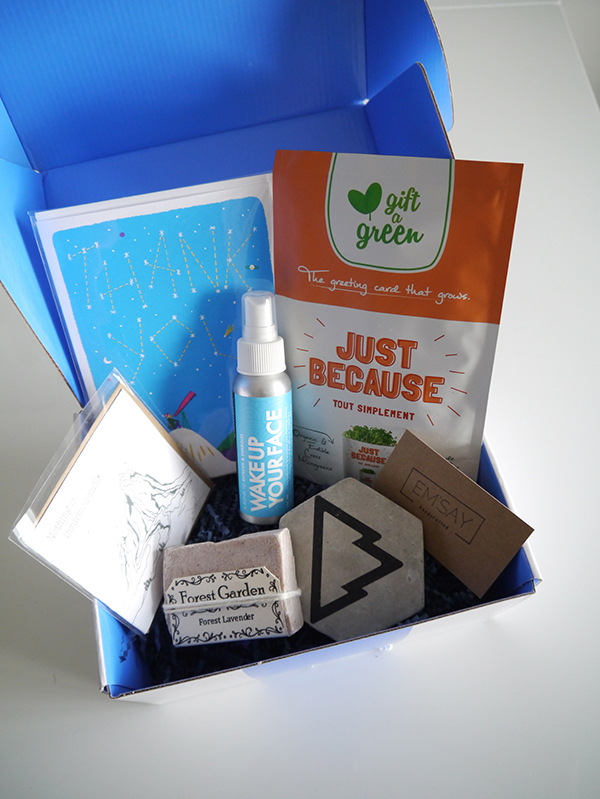 The Vancity Box format previously featured one maker's wares at a time, but starting April of this year, this switched things up by offering a hodgepodge of products from different artisans. Here's what was in the April 2017 box I received for review. Item: This Gift a Green pouch is a mini garden and greeting card all in one. 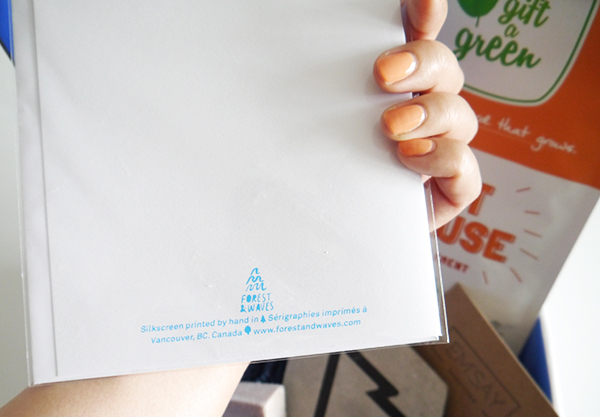 Simply follow the instructions on the back of the envelope, snip the opening, and water. (There's soil already inside.) In 1-2 weeks the recipient will have edible cress microgreens. Would I purchase this myself? No. This might just be me, but I'm really not into greeting cards with seeds in them. I'm too lazy to do anything with a card's seeds, but I'd feel guilty and wasteful just throwing out or composting the seeds. If you ever want to send me a card, just send me a normal card I can display, enjoy and recycle guilt-free. Please and thanks. 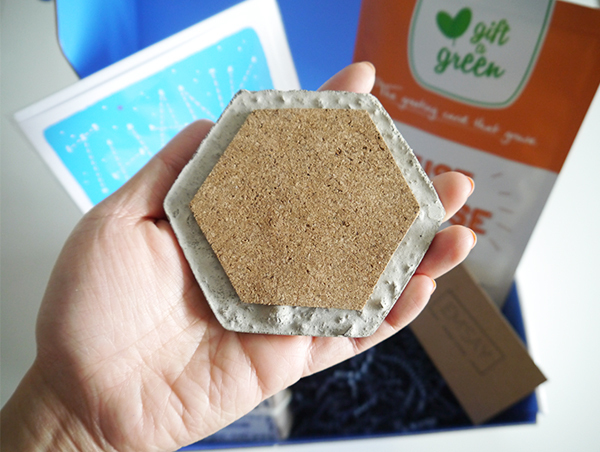 Item: This Em-say handcrafted concrete coaster is shaped like a hexagon with a mountain motif painted on the front and a cork backing. Would I purchase this myself? No, because I'm pretty particular about my coasters. I prefer a matching set to having random ones and I don't like heavy ones. 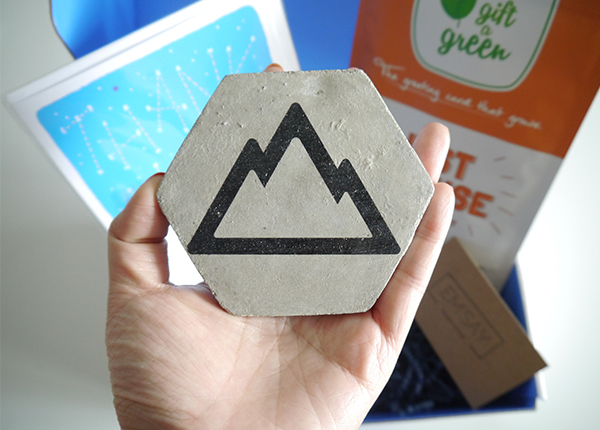 But getting the coaster did prompt me to check out the Em-say website and I'm intrigued by the concrete planters. So cute! 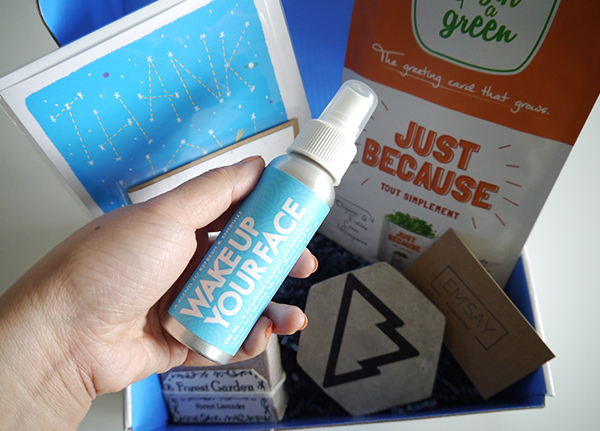 Item: This Wake Up Your Face spray by Whiffcraft refreshes and energizes with its all-natural blend of water, alcohol and essential oils. The scent is heavy on spearmint and eucalyptus, the product comes out in a fine mist, and the stainless steel bottle keeps contents cool. Simply shake and spritz in the morning and anytime you need to perk up. Would I purchase this myself? Yes and yes! This spray is awesome for 3pm slumps and refreshing my face after a sweaty workout or walk outside, or for deodorizing linens and closets around the condo. I've been getting into more green beauty and aromatherapy lately and this was a pleasant introduction to new-to-me, made-in-Victoria Whiffcraft. 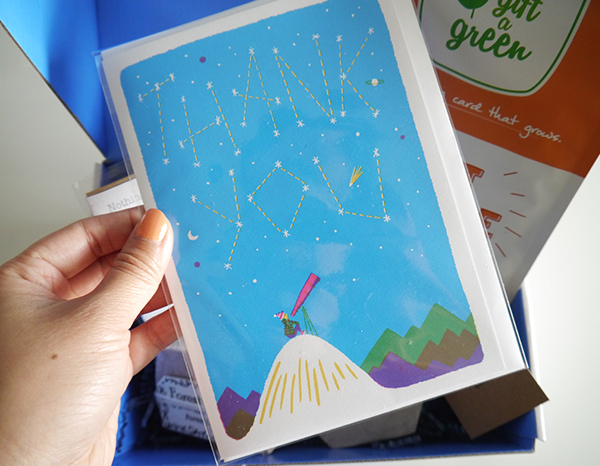 Item: It's always nice to have spare thank-you cards on hand. This one by Forest & Waves features an amateur astronomer on top of a mountain, staring at a starry night sky. Would I purchase this myself? Maybe. The card design isn't one I'd necessarily choose for myself, but it's whimsical and the design and paper quality are there. 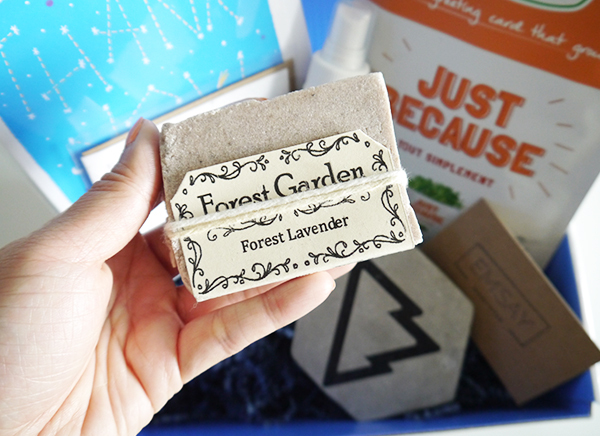 Item: A sizable block of Forest Garden all-natural soap in lavender. Would I purchase this myself? Yes. 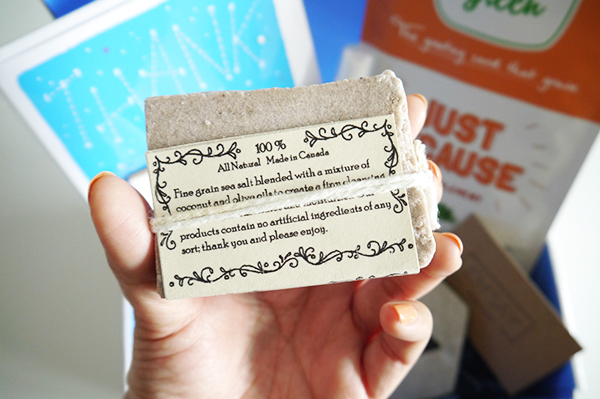 For green beauty devotees, it's often easier to find locally made, all-natural soap than body wash, and soap is usually more affordable too. The lavender scent is strong and luxurious. 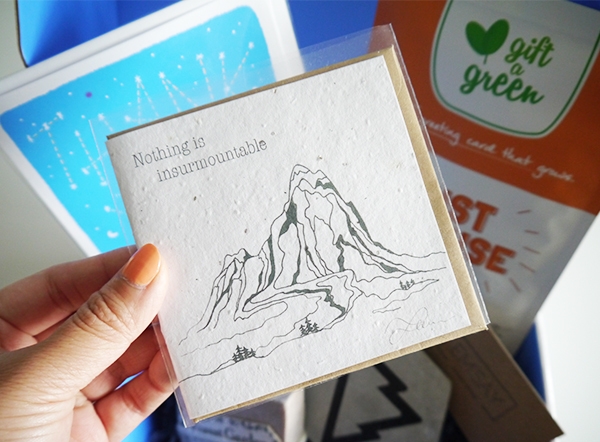 Item: This small, square Flower Ink card features an ink drawing of a mountain on the front with the words "Nothing is insurmountable." 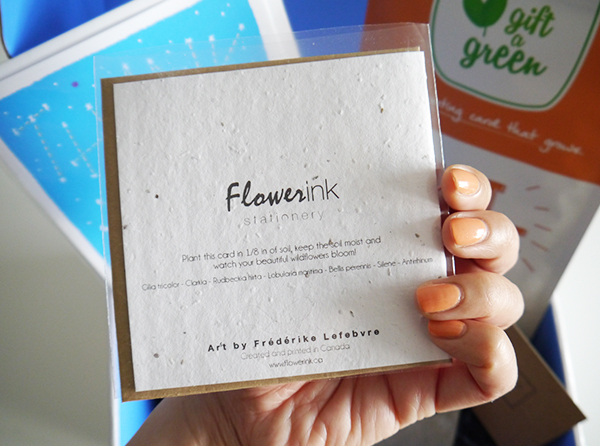 The textured seed paper can be planted in soil and used to grow wildflowers. Would I purchase this myself? No. See above. Out of the 6 products that came in the Vancity subscription box, I'd purchase 2 of them on my own. 1 was a maybe, 2 were definite misses, and 1 wasn't to my taste but came from an intriguing maker. All of the products were from local makers and labels that were new to me and that I wouldn't have otherwise come across on my own. 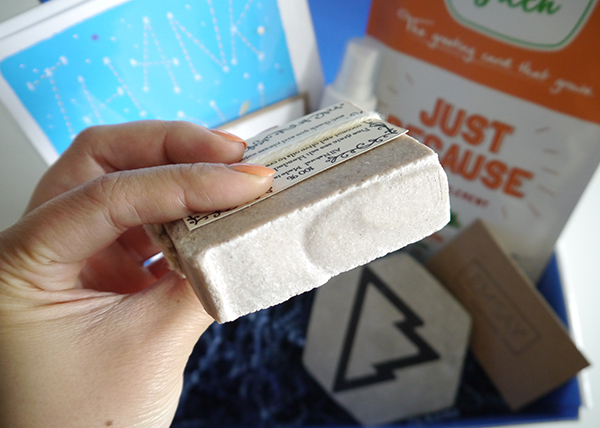 If you're open to trying new things and you're not as particular as I am, the Vancity subscription box is a fun way of supporting, buying, and discovering local. I've never heard about this box! But that lavender soap seems really great. 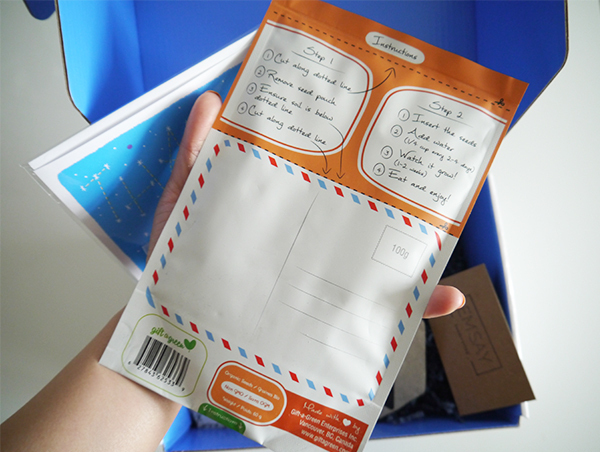 It made the whole subscription box smell good! I get super excited when I get things with wildflower seeds in them (microgreen seeds sound even better) but I NEVER get around to planting them and then I feel guilty and wasteful, so I'm with you 100% on that one.